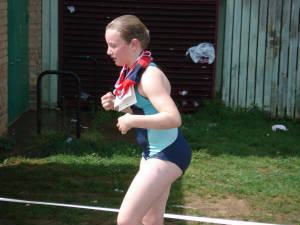 FARINGDON AQUATHLON - RESULTS NOW AVAILABLE! Kids brave the rain to put on shining performance! 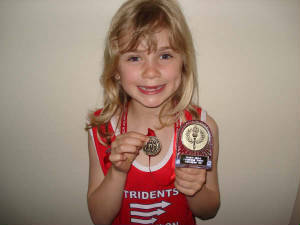 47 young triathletes braved the elements Saturday to make everyone proud and achieve some great results. Thank you to all the marshals and volunteers who helped make the event possible. A big thank you especially to Dave Zimmer and family whose efforts were outstanding! 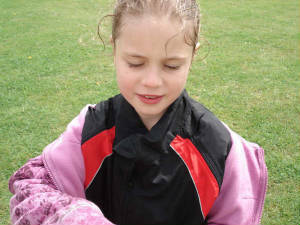 Megan drenched but spirits not dampened! DAME KELLY HOLMES GIVES TRIDENTS THUMBS UP! Dame Kelly Holmes came to Farnborough and met Alex, Head Coach of the Tridents. 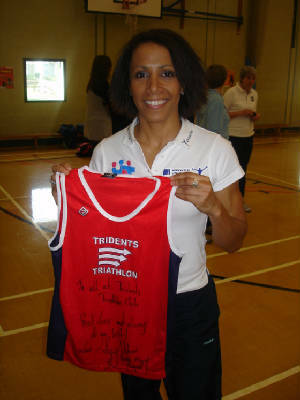 She even took time to sign a Tridents Vest which reads: To Tridents Triathlon, Good luck and always try your best. Kelly Holmes, Double Olympic Champion! Great advice from a great champion! THINKING OF JOINING? THEN CLICK HERE TO CHOOSE THE RIGHT PROGRAMME FOR YOU! TRAINING SESSION CALENDAR Click here to go to find out what's on this weekend! 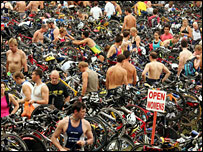 Who is the fastest on the Swim, Bike or Run in your age group? Click here to find out! Click here to go to training tips page! Ellie Zimmer with her first of many trophies! Click here for a full events calendar 2007!